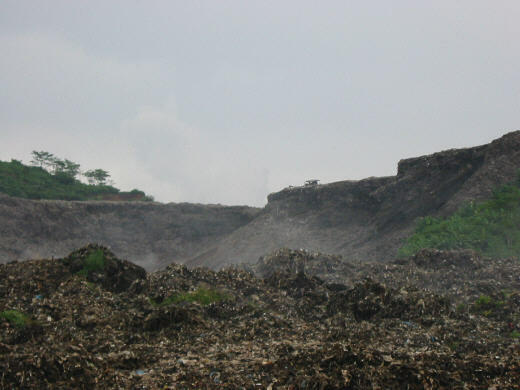 The Leuwigajah dumpsite is located close to Bandung, the capital of Indonesian Western Java Province, 180 km South-East of Jakarta. 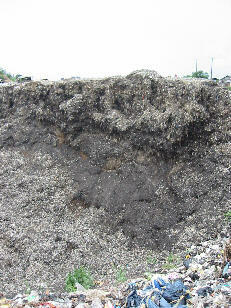 4500 t waste from Metropolitan area Bandung is delivered to the site. The landfill has been established in a narrow valley. The location offers a favourable hydrogeological situation with a bedrock covered by a thin layer of 1m clay. Precipitation is high in the region between 1500-2000 m per year and significantly non-uniform. Waste disposal procedure was carried out on a basic level. Dumping started from the top of the valley dropping the waste just over the edge. 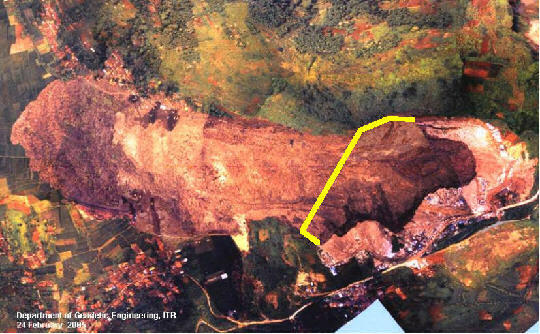 After 3 days of heavy rainfall, the landslide happened on February 21st, 2005, when 2.7 mio cbm waste started sliding down the valley. The waste covered an area of 900 x 300 m. 147 people died in the ruins of two settlements. The satellite image, assembled by Institut Teknologi Bandung, shows the scenery. the yellow line indicates the former boundary of the dumpsite. 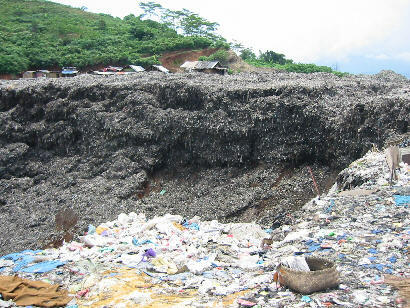 Just a winding waste cliff was left from the former 70 m high dumpsite. The forensic analysis obtained some interesting results. 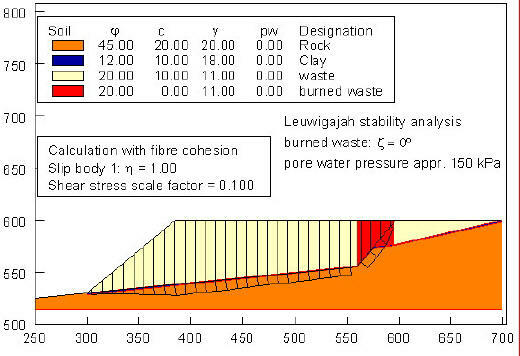 The stability was affected by two major causes: Pore water pressure was generated in the surface between clay and waste due two ground water and surface run-off. 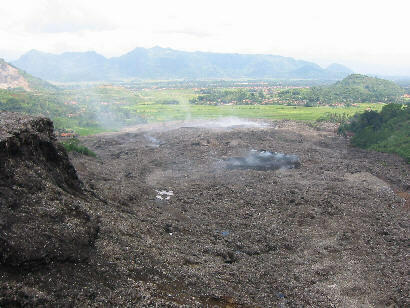 Simultanously, smouldering fires in the upper part of the landfill had combusted plastic and paper particles, which acted as reinforcement. The fornesic back calculations considered this effect by means of reducing fibre cohesion and cohesion to zero. Finally, the sliding body shown in figure 7 came out as the most unfavourable one while still matching the oberserved failure geometry.